Dr. Y. Richard Kim is a Distinguished University Professor in the Department of Civil, Construction, and Environmental Engineering at North Carolina State University. 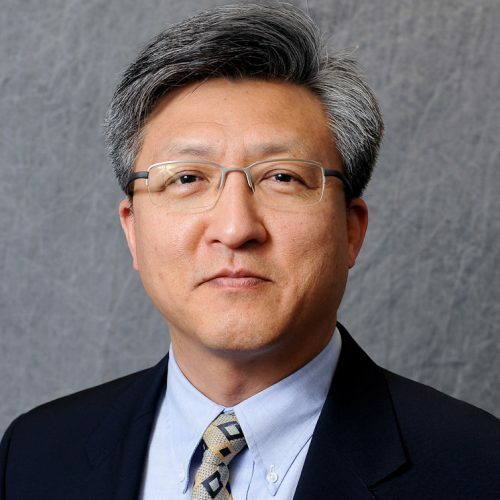 Professor Kim’s specialty areas include: characterization and performance modeling of asphaltic materials and asphalt pavement systems; condition assessment of asphalt pavements; pavement evaluation by accelerated pavement testing; and pavement preservation. Professor Kim is a Fellow of the American Society of Civil Engineers and a member of several other professional organizations, including the Transportation Research Board, the Association of Asphalt Paving Technology, the American Society of Testing and Materials, the Korean Scientists and Engineers Association, and the International Society of Asphalt Pavements (ISAP). He is the founder and first president of the Asian-American Pavement Engineers Association. He is also a board member of ISAP and the Chair of the 2014 ISAP Conference on Asphalt Pavements. Dr. Kim teaches CE 332 Materials of Construction, CE 595A Bituminous Materials, CE 594C Nondestructive Evaluation of Civil Infrastructure, CE 755 Highway Pavement Design, CE 757 Pavement Management Systems, and CE 759 Inelastic Behavior of Civil Infrastructure. He was named the Alumni Association Distinguished Graduate Professor in 2012 for his excellence in teaching and mentoring. Dr. Kim has published over 200 papers in national and international technical journals and proceedings. He is the editor of the ASCE book entitled Modeling of Asphalt Concrete. Professor Kim is currently an Associate Editor for the International Journal of Pavement Engineering and a member of the editorial boards of three other international journals. He is also a member of the Federal Highway Administration Asphalt Mixture and Construction Expert Task Group and Pavement Preservation Expert Task Group. Among numerous awards, he is the recipient of The Alcoa Foundation Engineering Research Achievement Award in 1998 and a recipient of the Walter J. Emmons Best Paper Award by the Association of Asphalt Paving Technologists in 1997, 2006, and 2009. Dr. Kim's research interests are in pavement design and rehabilitation, bituminous materials, pavement preservation, nondestructive evaluation of pavements, and performance modeling. Wargo, A., Safavizadeh, S. A., & Kim, Y. R. (2017), Transportation Research Record, (2631), 123–132. Safavizadeh, S. A., & Kim, Y. R. (2017), Journal of Materials in Civil Engineering, 29(6). The Federal Highway Administration (FHWA) has fully supported Quality Assurance (QA) and advancing components of QA for many years. One of those components is Performance-Related Specifications (PRS). As the PRS efforts have advanced additional needs have been identified in order to complete an further advance the research further. This project will serve to further develop, improve, and validate the developed relationships for the PRS. A number of tasks will be completed in order to meet the following specific objectives: â€¢	Development of Level 1 Performance Engineered Mix Design (PEMD) method and threshold values for Level 2 PEMD index parameters â€¢	Performance testing for transfer functions to support PEMD for PRS â€¢	Comparison of Balance Mix Design (BMD) and PEMD testing for PRS â€¢	Advance in a collaborative approach for FLEXPaveâ„¢ PRS models utilizing existing calibrations for AASHTOware Pavement MEâ„¢. â€¢	PRS training and shadow projects. â€¢	Coordination with existing PRS research for the development of a comprehensive written marketing plan. â€¢	Interim stakeholders PRS Status Meeting. â€¢	Under this task, the team shall create a system of tools including guidelines and sample specifications for agencies to transition from the traditional QA standard specifications to standard PRS. Although geosynthetics have been used in paving applications for well over fifty years, one area of critical need in North Carolina is the standardization of the materials themselves and their applications for actual pavements. The North Carolina Department of Transportation (NCDOT) has been working with the Geosynthetic Materials Association (GMA) to develop a Special Provision for an improved geosynthetic pavement interlayer material and a distress chart to provide useful data for product selection. The main goal of this effort is to ensure that NCDOT engineers can choose appropriate geosynthetic pavement interlayer products for a specific application based on performance data. As part of this effort, the GMA has recently developed five standard categories of geosynthetic materials for pavement applications. Although these categories provide the NCDOT with a good foundation to build the Special Provision and the distress chart, further research is needed to identify a list of properties and performance criteria that products must meet in order to perform adequately for their intended function. AASHTO TP 107 enables the practical, mechanistic performance characterization of asphalt concrete using cyclic fatigue testing in the Asphalt Mixture Performance Tester (AMPT). AASHTO TP 107 was initially developed for the use of 100-mm diameter specimens, which yield a single test specimen per gyratory sample. Recently, a modified version of AASHTO TP 107 was proposed for the testing of 38-mm diameter small specimens that improves the efficiency of specimen fabrication and enables the testing of field cores extracted from as-built pavement layers. The objective of the proposed research is to improve AASHTO TP 107 by conducting ruggedness and interlaboratory studies using both small and large specimens. The ruggedness evaluation will identify controllable experimental factors that significantly affect the test results and to establish limits for their control. The interlaboratory study will lead to precision statements that define the repeatability and reproducibility of small and large cyclic fatigue the test results. The importance of proper bonding at the asphalt concrete (AC) layer interface cannot be overemphasized when discussing the performance of AC pavements. A strong bond between the layers is critical to dissipate shear stress throughout the entire pavement structure. In contrast, insufficient bonding may cause slippage and debonding between the asphalt layers. To mitigate the debonding distress, the type, quantity, and quality of the tack coat materials that are applied between asphalt layers need to be addressed properly. This project will implement the performance-related specifications currently being developed by the PI from the FHWA project (557884) to a paving project in North Carolina. The PRS will be implemented as a shadow specification to evaluate the efficiency and feasibility of the testing program. The dynamic modulus (|E*|) is the main parameter that is used in modeling pavement responses in the Pavement ME Design program. Therefore, the rehabilitation design feature of the Pavement ME program requires the determination of the |E*| values of existing asphalt layers. The Pavement ME guide recommends three different approaches to determine the |E*| values of existing asphalt layers. The Level 1 and Level 2 approaches require the use of the Witczakâ€™s predictive equation, which could result in up to 100 percent error. The Level 3 approach also has a high probability of yielding erroneous results because it is based on pavement condition survey data. The specific innovation to be developed is a small specimen geometry for uniaxial asphalt mixture dynamic modulus and direct tension fatigue testing in the Asphalt Mixture Performance Tester (AMPT). Two small specimen geometries will be tried: a small cylindrical geometry consisting of 38mm diameter specimens with 100mm height and a small prismatic geometry 25mm thick, by 50mm wide, by 100mm tall. Both uniaxial cyclic, direct tension and monotonic direct tension (constant strain rate) testing for fatigue characterization will be considered. The small specimen geometry will allow for testing individual layers of as-built pavements, allowing for forensic investigations of field performance and performance-based construction quality assurance. In addition, use of small specimens can greatly improve laboratory prepared mixture testing efficiency by allowing for extraction of multiple small test specimens from a single gyratory sample. Fatigue performance evaluation will be facilitated by applying the Viscoelastic Continuum Damage (VECD) mechanics to fatigue test results. The review of the existing construction procedures and the discovery of inaccuracies with regard to the material rates applied in the field have revealed a clear need for significant improvement in the construction equipment and material application methods that are currently in use for the construction of chip seal surface treatments. Specifically, the existing construction methods do not allow for the accurate control of the emulsion application rates (EARs) and aggregate application rates (AARs) in the field construction. This problem of rate control can lead to construction variability that, in turn, leads to chip seal performance problems and also wastes critical NCDOT pavement preservation funding. The objectives of the proposed research are: (1) to identify the sources of construction and material variability in chip seal construction; (2) to determine the range of the variability and the impact of the variability on the performance of chip seals; (3) to identify those variables that have the most significant impact on chip seal performance; and (4) to identify methods to reduce the variability of these key variables and to test for performance. The proposed research will employ both field construction and sampling efforts as well as a laboratory experimental testing plan to identify and quantify the variability associated with chip seal construction.